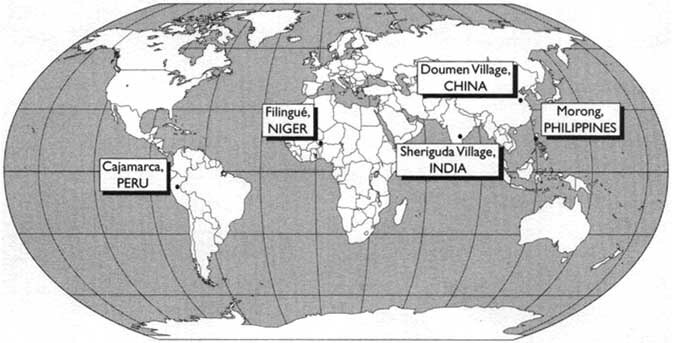 The FES protocol was field tested during 1993-1994 in five areas selected for diversity in culture, environment, and food system type, and availability of a capable field team (see Map 1). The objectives of the field testing were to find whether the protocol could be used in the particular environment and culture; in other words, could the research questions be answered using the procedures as described? We also wanted to address key elements in personnel training and timing. Finally, we wanted to know if usable information resulted in the development of potential intervention plans for the improvement of vitamin A status. The academic backgrounds of the field teams were diverse, which was evident in the ways they implemented the procedural testing. The reports given by the field teams in Chapters 4 through 8 reflect these differences. We have confidence that the protocol instructions can be understood easily, and that they apply equally to a range of different cultures, environments, and field situations. Field testing took place in highland Peru, in the district of Cajamarca, in two areas: the Comunidad Campesino de Chamis (rural) and the Barrio de San Vicente (urban). Field testing was under the supervision of Dr. Hilary Creed-Kanashiro of the Instituto de Investigacion Nutricional in Lima. The field team leader and the field assistants were from the local area and trained as nurses: Rocio Narro (team leader), Charito Barrenachea, Doris Saldona, Elena Sanchez, and Idamia Bustamante. The field testing took place in September and October in both places. Harriet Kuhnlein made a site visit from October 5th to the 10th. This field test provided valuable guidance for conducting the protocol in adjacent rural and urban communities. It was not possible to sample an identical culture in both communities, although the environments were similar. It was found that, because of the availability of a greater variety of market food in the urban area, the food list for conducting the modules varied somewhat from that of the rural area. The project team devised excellent methods for deciding on the final list of thirty food items with which to complete the studies; their strategy for selecting the households in the urban area was exceptional as well, and is included as an appendix to the protocol manual. The assessment protocol was conducted with the Hausas of Filingué under the supervision of Lauren Blum, a cultural anthropologist with extensive previous field experience in Niger with the Peace Corps and Helen Keller International. Lauren conducted the preliminary test to construct the first draft of the manual, as well as a final field test. The last field test took place in the arid area of Niger during November and December, 1993. She produced exceptional field notes and reports on the various test procedures. Of special note was the fact that the protocol could be conducted with two village-resident field assistants who did not have any education beyond high school. They were able to conduct the interviews in Hausa and record the responses in English. Green leafy vegetables were a valuable source of provitamin A in this area, but little food composition data exist for these items. There is a word for nightblindness in all four of the languages spoken in the area, and it is recognized as a common problem, as are Bitot's spots and corneal ulceration. The field test in China was conducted with the people of Doumen Village, Kai Feng Municipality, by Dr. Li Wen Jun of the National Institute of Nutrition and Food Hygiene in Beijing. The procedure was tested during September and October, 1993. The field team consisted of Dr. Li Wen Jun. Dr. Li Dan, and Ms. Chang Su Ying, assisted by Mrs. Bai Yan, Miss Yuan, and Mr. Wang Wei Dong. Dr. P. Pelto conducted a site visit with the team September 26th to October 6th. Several varieties of wild vegetables collected from the field were found to be seasonal and infrequently used. A fascinating account was given about why the people of this village refuse to eat carrots. Nightblindness is common in the area, and cod liver oil and pig or goat liver are recommended by public health authorities as a remedy. Field testing in the Philippines took place during both wet and dry seasons with the Aetas of Canawan, Morong district, under the supervision of Dr. Cecelia Santos-Acuin. Dr. Acuin had previous experience with the preparation of an ethnographic manual for respiratory disease. She organized a field team consisting of Dr. Troy Gepte, Ms. Tina Dedace, and Ms. Mila Fulache; the latter two persons having B.Sc.s in Nutrition. Dr. H. Kuhnlein conducted a site visit from September 19th to September 25th. As with all the field test sites, there were many valuable experiences from this area. Of particular note was the realization that only some of the modules required repeating for the change of season. The key foods list, and the use of particular food items changed somewhat, but people's perceptions and beliefs about food did not. Performing the assessment in two seasons enriches understanding of acquisition and food frequency, and greater knowledge of the market availability of food. Also noteworthy was Dr. Acuin's suggestions for additional components of the research report from the assessment, revisions to the manual structure, and suggestions for appendices to the manual. Data from this area led to the inclusion of the 24-hour recall preliminary to the food frequency questionnaire. This technique was found to ground the interviewee in concepts of how often something is eaten. Several other excellent suggestions were offered. Of all field test sites, the community food system in this tropical, coastal area contained the greatest number of food items, and many of them did not have food species identification or composition data available. In India, the field test took place with the people of Sheriguda village, Ranga Reddy District, Andhra Pradesh, under the supervision of Dr. S. Vazir and Dr. Pushpamma. A site visit and training session was conducted by Dr. P. Pelto from November 28th to December 5th. In addition, the research team from the National Institute of Nutrition in Hyderabad) included Ms. Uma Nayak, Ms. Anita Naidu, Dr. Anjhali Devi, and Ms. N. Saroja. The assessment protocol was exceptionally well received by the Indian team. They recognized the need for knowing the perceptions, needs, and resources of the community which are strongly influenced by social, cultural, environmental, and economic considerations, and their value in planning and implementing nutrition interventions relevant and appropriate to the community. They reported that the application of the ethnographic techniques suggested in the manual gave answers for many "why's," and helped them understand factors that influence the food behavior and forces responsible for changes in behavior. Important information from this area included the highly variable seasonality of food availability and the economic situation of families. It appears that most of the sights of xerophthalmia are rarely experienced here, even though they are documented in health reports. The team suggested revisions to tile format of the food system data tables, the timing and equipment of the field assistance, and suggestions to several modules. In this area of India, it was difficult to define quantities of food consumed and the price per serving because of great variability of serving sizes within households. To a large extent, the widespread applicability of the protocol manual is due to the similarities in basic food use patterning in human societies. Compared with religious practices, political arrangements, family structure, and many other areas of culture, food and diet are much more constrained. These constraints are more pronounced in small children and pregnant women, the groups most at risk for vitamin A deficiency. The FES approach for community assessment of natural food sources of vitamin A is intended to address a specific need for new ways to understand food use and diet in areas of serious vitamin A deficiency. While we recognize the use of vitamin A supplementation, in the form of capsules and other methods for target populations, more sustained and economically sound measures should include serious attempts to improve the use of locally available vitamin A-rich food. In part, this manual is based on the faith that such approaches to malnutrition can be effective, provided that there is sufficient, carefully gathered information available about current food quality, food practices, and peoples' reasons for choosing their food consumption patterns.